accessories development lenovo Mods moto Moto mods snaps Speaker Moto Mods - what are they? 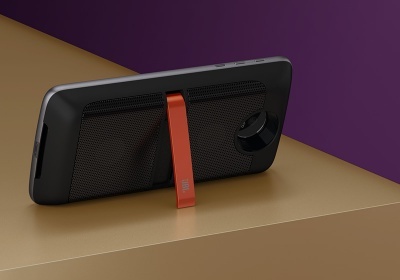 Moto Mods - what are they? Modular devices are going to be the new fad. First there was Phonebloks, then Project Ara, then there's a similar ecosystem of accessories with Samsung and their Gear lineup. Then most recently we saw the LG G5 with it's interchangeable bottom grip and their lineup of "Friends". It's definitely a growing sector. And Moto wants in. So, we saw the Moto Z unleashed yesterday and with it a new line up of it's accessories to go with that device (and they also mentioned compatibility for future devices). They showed it off in what I thought was a rather awkward moment by having Ashton walk out and what looked like a phone held in his hand they pt them together as if they were to have them beam something to each other, and then just held it together just a moment too long... it was a little awkward, and then they showed that it wasn't a second phone but an accessory that was meant to stick to the original phone. It'll connect to your phone and provide a nice sound boost. A stereo speaker with 3W per side. This would be awesome as I tend to always have a portable speaker with me on trips and this would be far easier (and it's more battery). You can't have a module and not have one of them be a battery pack. It will also support rapid charging to get that pack back up to snuff quickly. This is the one I'm most excited about. I've always looked about for a decent pico projector that I can use with my phone and here's one that snaps onto the phone. Powering a display that can make 70" on a screen at 854x480 (so not a super great display, but hey, it works just by connecting to the phone itself - what more do you want?) 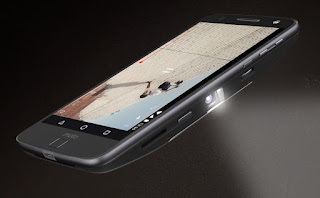 will take some power and it's included an 1100mAh battery for that. Like I said, how can you not have a battery with your mod? This extra power will provide 60 minutes of projection time (hey, it's got to power a lamp). What was neat to see is that the little kickstand there can be used to help angle the projector - not sure how it weights itself so that it doesn't tip over when it reaches 90 degrees tho'. 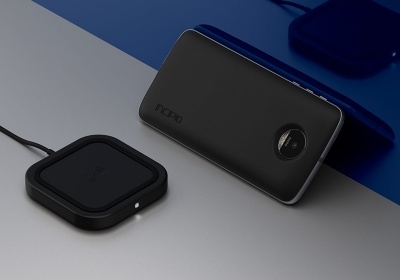 Now, there's no mention whatsoever about pricing on these - but we were told at the announcement that they would be available at the launch of the Moto Z. But the real sweet nugget was their announcement of the Motomods development kit, where they want us to make the next series of accessories (now where have we heard that before?). The concepts they had from the labs was pretty inspiring (hopefully it starts it at 1:37:29). My favourite was the OneCompute, what was yours?